I’m back again with another game review, but this time I had to spend a lot of time playing the game weighing pro’s and cons and really trying to think about how I honestly felt about this game. I’m normally pretty aware of which way my opinion is going to swing after a play or two, but with HEAP, I had to give it about 5 tries to fully absorb my own thoughts. The good news is, the game is fun, and I think some people will really like it. I myself like it, but it might not be for everyone, which may seem like an obvious statement but please read on to see exactly why. 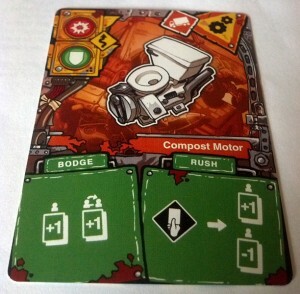 Rev Up Your Compost Motors! So what exactly is HEAP about? 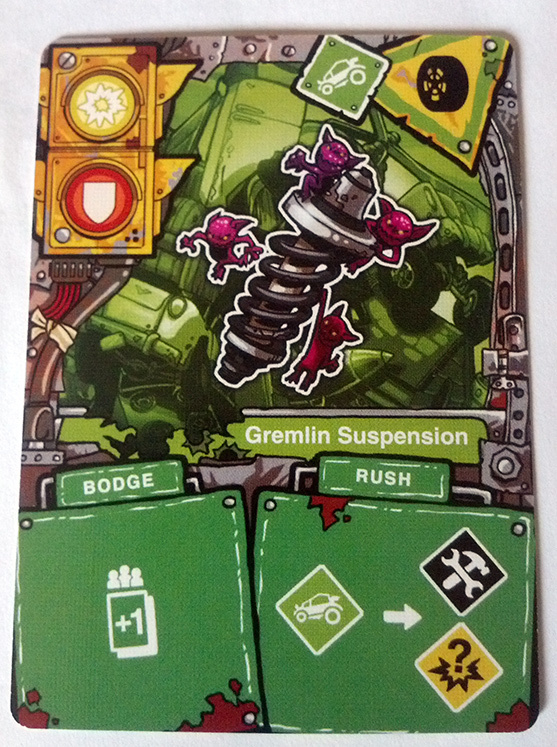 Following in true bodger tradition, it’s about cobbling together wacky scraps of technology and using all that “goblin intuition” to beef up your vehicles, effectively turning them into razor clad, lightning spewing death machines. The goal of the game is to shoot out your opponents tires and splatter them all over the pavement as quickly as you can. It’s like a destruction derby set in a goblin junkyard, it’s not necessarily about how good your parts are, but how fast you can bolt them on and go. This is where my first issue with the game cropped up, the box said it played in 30 minutes but that wasn’t happening for my group, it was more like an hour. Once we learned to just run and gun, the game became a lot more fun. Heap isn’t meant to be pondered, on your turn spending more than 30 seconds trying to figure out which wacky motor or which crazy set of tires to trick out one of your vehicles with means you’re doing it wrong. If you can turn off “chess mode” in your brain, Heap plays exactly as intended, if that’s not case, I can’t guarantee how much fun you’ll have with this game due to the pileup phase, which ends the game. Allow me to explain. The game plays in phases, and each card has sections for each phase on them as well, it actually works really well compared to the small font used in Infernal Contraption. There’s a bodge box for the bodge phase, a rush box and stoplight combat indicator for the rush phase and a vehicle icon and part type. The parts types are motors, wheels, weapons, and bling, you can only have one of each type on your vehicle. 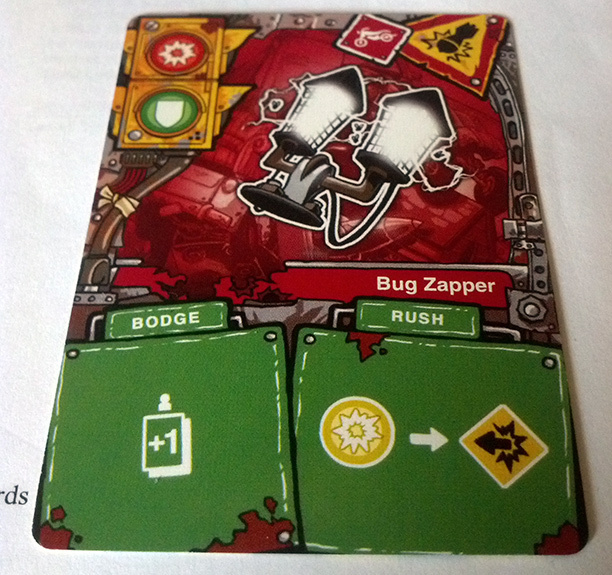 Each player has 4 vehicles: a Gyrohopper, Big Rigg, Doom Buggy, and a Scrap Hog each with their own benefits and ready to trick out with crazy parts. 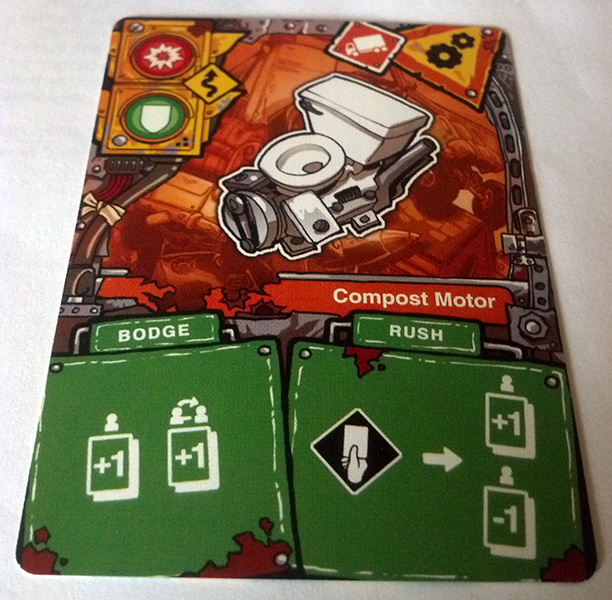 Everyone adds up to 2 parts to their vehicles which usually results in you and/or your opponents picking up cards, discarding them, shooting out parts, or adding cards to your haul pile (essentially freebie upgrades at the end of the round). You can add more than 2 parts at the cost of discarding another card, you also draw cards before this phase if you don’t have enough in your hand and there is no maximum hand size in this game. After the bodge phase, then you head to the rush phase, where everyone decides which of their vehicles to take to battle – unless of course a player played a challenge card during the bodge phase, in which case you’ll be taking whatever vehicle they tell you to. During this phase you’ll use the cards in your hand to play back and forth in a stoplight color-coded battle setup, using the vehicle and all its wacky parts that they’ve taken to the rush as an additional means of giving you a leg up during the rush. The color coded combat is really simple, and fast, which is a theme that this game has in spades. It’s pretty simple wherein if I play a card that has a yellow attack, you need to block with yellow (or a more rare ‘block all’ card). There is a bit more to this but not much and I won’t delve into the minutia here, if you care for a full 8 minute how-to video, Privateer Press has one and it’s pretty great. Anyway, play like this goes around the table, once a player can no longer attack/block they are out of the rush and this repeats until only one player is left and they are the winner of the rush. 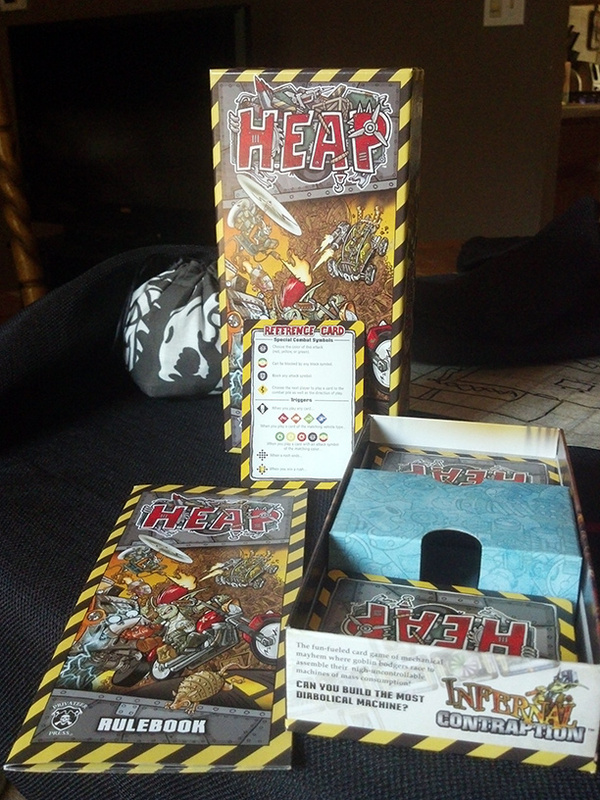 Players grab all the cards (if any) in their haul pile, and may attach as many of them as they like to their vehicles. If you win the rush, sometimes you get additional haul cards. The bodge and rush phases repeat until at least one player has upgraded 3 of their vehicles with 4 upgrade parts. This is where things started to feel a little fruitless for me, and why I mentioned the game was not for everyone earlier. I say this because all of the parts which you’ve been attaching to your vehicle and building up to this moment are all thrown out the window. Even winning the rush in this game doesn’t mean much unless you have a vehicle that indicates when you win the rush you get additional cards. There is a lot of gameplay within heap that is only temporary and my own personal hangups get in the way here, I really like when I feel as if the decisions I make carry through a game, no matter how small the game may be. After several playthroughs I could learn to shake that and just play the game full throttle, that’s when I started having a lot of fun with it. It’s all just a means to the end, and it should be a nitty-gritty, fast ride toward the pileup phase, at which point – anyone can win the game. The pileup phase is just another rush phase, which also acts as the final phase of the game but with a few significant changes. The first player to get 3 or more parts on all 4 of their vehicles triggers it, at which point that player and all other players will flip vehicles that had 3 or more parts on them over to their turbo side and discard all of their parts and their entire hand of cards. Then, players will total up the number of cards to draw determined by their turbo and non turbo vehicles, discard the number indicated and rush for one last time. The winner of this will win the game. So as you can see, being the first player to get all of your vehicles upgraded gives you the advantage of having “turbo” vehicles in the end round of the game, allowing you better abilities and giving you more cards to draw from. So basically no matter how the game goes down, the end phase mostly levels the playing field once again. It makes 80% of the time spent playing feel totally pointless, but I think that’s only if you’re looking at the game too hard like I was. It doesn’t seem very crazy goblin deathfest to have a near-level playing field at the end of the game, it seems it should be almost the inverse because goblins aren’t fair little people. Regardless, as I’ve mentioned before, if you can get past this hump, I think that Heap is a great game to kill time with or play with a younger crowd. The overall look and feel of the game is great, the artwork on the cards is stunning, bold, and really colorful. The game puts a lot of emphasis on symbols instead of words, which makes it pretty accessible for the younger crowd too, which is a bonus in my book. Since this is another game in the Bodgers line from Privateer Press, the card quality is identical if not better than the cards shown during my review of Infernal Contraption. I was going to do an unboxing but it’s essentially exactly the same but the cards have different art, fear not though as I’ve snapped a few pics of some of my favorite cards for the review. Overall I’d say heap is a good game, it’s priced reasonably at $22 on Amazon and makes for a good way to spend some time in between games or get younger kids into tabletop gaming. My son has enjoyed learning to play Heap and is overwhelmed with the theme of the game, the ending phase doesn’t seem to bother him much. That about wraps it up, thank you guys for reading and if you do decide to pick up heap, please use the links here within my article. Until next time, game on!